“For the first time in history, a female voice opens the general debate,” said DILMA ROUSSEFF, President ofBrazil, stressing that it was the voice of democracy and equality reverberating from the most representative podium in the world. It was with personal humility, but justified pride as a woman that she met this historic moment. “I am certain this will be the century of women,” she said, noting that in Portuguese, words such as life, soul and hope, as well as courage and sincerity, were feminine nouns. Underlining the present extremely delicate moment, she said that unless the global economic crisis was overcome, it could become an unprecedented and grave political and social rift capable of causing serious imbalance in relationships among people and among nations. Yet, the crisis was too serious to be managed by a small group of countries. While their Governments and central banks continued to bear greater responsibility in taking the process forward, all countries suffered the consequences. Thus, all of them had the right to participate in the solutions. It was not a lack of resources preventing the developed world’s leaders from finding a solution, but a lack of political resources and clarity of ideas. Caught in a trap that did not distinguish between partisan interests and the legitimate interests of society, part of the world had yet to find the balance between appropriate fiscal adjustments and the proper fiscal stimuli to growth. The challenge was to replace outdated theories that originated in an old world with new formulations for a new one. To that end, she said coordination must be intensified between the United Nations and other multilateral institutions, such as the G-20 and the International Monetary Fund (IMF), while fiscal and monetary policies should be subjected to mutual scrutiny. The priority must be resolving the problem of sovereign debt crises and turning back the tide of recession. Developed countries must put in place coordinated policies to stimulate those economies most weakened by the crisis. The financial system’s regulation must also be reinforced and the inexhaustible source of instability controlled. Floating exchange rate regimes should be adopted to control the currency war, while the reform of multilateral financial institutions must proceed. Protectionism and all forms of trade manipulation should be fought. Brazil was doing its part by keeping spending under strict control and strengthening its domestic markets through income distribution policies and technological innovation. Her Government maintained that the cause — and not just the consequences — of global instability must be addressed. Recalling the mass demonstrations now known as the “Arab Spring”, and underscoring Brazil’s wholehearted support for the search for the universal ideal of freedom, she said United Nations Member States must be united in finding legitimate and effective ways to aid those societies that called for reform, while keeping their citizens in the lead of that process. Brazil vehemently repudiated the brutal repression of civilian populations, but remained convinced that the use of force must always be a last resort. Moreover, the quest for peace and security must not be limited to interventions in extreme situations. While much was said about the responsibility to protect, little was heard about responsibility while protecting — two concepts that must be developed together. She stressed that the Security Council’s role was vital in that regard, arguing further that the more legitimate that body’s decisions, the better it would be able to play its role. But the Council’s legitimacy hung on its reform, which, after 18 years, could no longer be delayed. “The world needs a Security Council that reflects contemporary realities,” she asserted, calling for new permanent and non-permanent members particularly from developing countries, and stressing that Brazil was ready to shoulder its responsibility as a permanent Council member. Welcoming South Sudan as the newest member of the United Nations, she pledged her country’s commitment to supporting its sovereign development. Brazil regretted that Palestine’s full membership could not yet be welcomed. Indeed, like the majority of the countries in the Assembly, Brazil believed that the time had come for Palestine to be fully represented. “Only a free and sovereign Palestine will be able to heed Israel’s legitimate desire for peace with its neighbours, security in its border and political stability in its region,” she said. 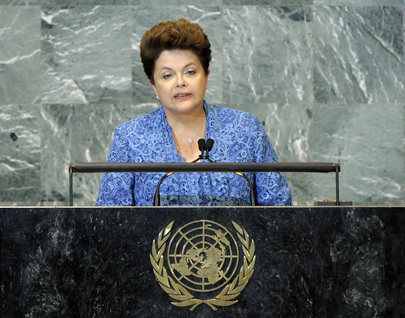 Turning to other matters, she underlined Brazil’s commitment to fighting climate change and reiterated her country’s invitation to all Heads of State and Government to attend the Rio+20 Conference in June 2012. She noted Brazil’s achievement of almost all of the Millennium Development Goals before 2015, recalling that 40 million Brazilian men and women had risen out of poverty and joined the middle class. As Brazil sought to eradicate extreme poverty, it would continue to work to empower women; it saluted the establishment of UN Women. She added her voice to those women who dared to struggle, to participate in politics and the workforce, and to forge political space, without which she could not stand before the Assembly. “As a woman who was tortured in prison, I know how important the values of democracy, justice, human rights and liberty are,” she said, expressing hope that those values would inspire the Assembly’s work this session.